Some favorites return, and we celebrate another local CD release. Not a bad way to spend a holiday weekend and hopefully a more spring-like week. Jazz Is Now, Nownet at the Loring Theater (April 15). Jeremy Walker’s swan song as music director of his nonprofit Jazz Is Now was an artistic blowout if not a sellout. With special guests Wessell (Warmdaddy) Anderson on alto and sopranino sax and Marcus Printup on trumpet, the Nownet blazed through two sets of mostly Walker compositions (and one gem from former Nownet saxman Scott Fultz). Fear not, Bryan Nichols will be taking over the artistic direction for Jazz Is Now, and we can expect a new ensemble, soon. The NickelNet? Snowblind at Jazz Central (April 19). Underground jazz is growing across the country and one of the best undiscovered venues is right here at Jazz Central. Google to find the website and get on the mailing list! The weekly Monday night performances have expanded into Tuesday, and this week we heard the brass quintet Snowblind. They don’t get together often enough, but it’s pure brass ecstasy when they do. They played a number of originals from saxman Shilad Sen and drummer Reid Kennedy, as well as a twisted arrangement of “Night and Day.” Day or night, they’re brasstastic. And another long-awaited gig, the return of the Fantastic Merlins also takes place Friday night (4/22), starting off with a master class at 5:30 followed by the performance at 8 pm at the Black Dog. All are welcome to the master class, which is free, and to the performance, which is a “pay-what-you-can” affair. The Merlins have undergone some personnel changes over their 7 year run, but saxophonist Nathan Hanson and bassist Brian Roessler are still in the mix, along with cellist Daniel Levin and drummer Pete Hennig, the group the appears on the acclaimed 2010 recording, How the Light Gets In. Among improvising bands that defy classification, the Fantastic Merlins have been one of the most popular locally, and the Black Dog has been their home base. But this will be their first performance here in months. So remember, the Black Dog is a pretty small venue—come early. And while you might not readily classify this as a jazz event, anyone who loves improvisation and the human voice would be hard pressed to find a more exciting talent than Bobby McFerrin, who returns to Orchestra Hall Friday night (4/22). Yes, too many options for one night! But if you have never heard McFerrin, now’s the time. Saturday night (4/23), How Birds Work flies in for a rare weekend gig at the Artists Quarter. 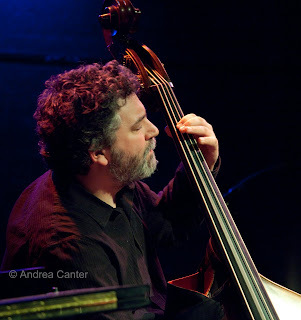 An almost monthly (weeknight) booking over the past 7 years, this night we’ll hear the original band, with Dean Granros, Peter Schimke, Billy Peterson and Kenny Horst. HBW has its own book of tunes and re-arrangements of favorite jazz works from the likes of Coltrane and Shorter, taking the music to the edge without falling off. 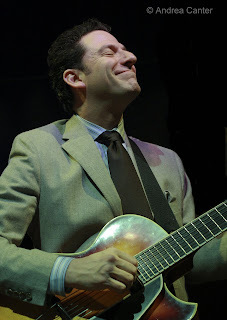 There are few musicians that perform with the joy of singer/guitarist John Pizzarelli (at the Dakota, 4/24-25). Son of famed guitarist Bucky Pizzarelli, John has been performing since his early teens and could be the poster boy for “Music Makes You Happy” campaigns. And he loves telling stories almost as much as singing and picking, so you know an evening with John will be grand entertainment. And his band is worth the ticket as well—brother Martin on bass, Larry Fuller on piano and Tony Tedesco on drums. Their latest recordings saluted the songs of Rogers and Hart, and Duke Ellington. Another long-awaited return, pianist/percussionist Omar Sosa brings his Afreecanos Quartet to the Dakota (4/27-28). Winner of a Smithsonian Institution Lifetime Achievement Award for promoting Latin American music in the U.S., Sosa fuses his Afro-Cuban roots with global music and electronica. In other words, traditional meets modern technology. It’s glorious and it’s fun. Also glorious and fun, and sometimes off the deep end, Ann Millikan reprises her recent House of Mirrors installation with one last blast on April 28th in the Hamm’s Brewery space in St. Paul’s Swede Hollow. For the finale, Ann brings in Geoffrey West Senn (trumpet), Pat O’Keefe (bass clarinet), Scott Fultz (saxophone) and Stefan Kac (tuba). This series of concerts grew from a McKnight grant, and Millikan created a multi-media installation, complete with large-scale musical scores and a performance space filled with “stations” of sound-producing objects that the musicians use to augment their own instruments. The result is a collage of sounds that is ever evolving. More about the music and composer here. Hard to classify but just call it wild improvised music. They play just above every month and usually on the last Thursday, but don’t let that frequency keep you from coming out to hear Pete Whitman’s X-Tet at the Artists Quarter (4/28). 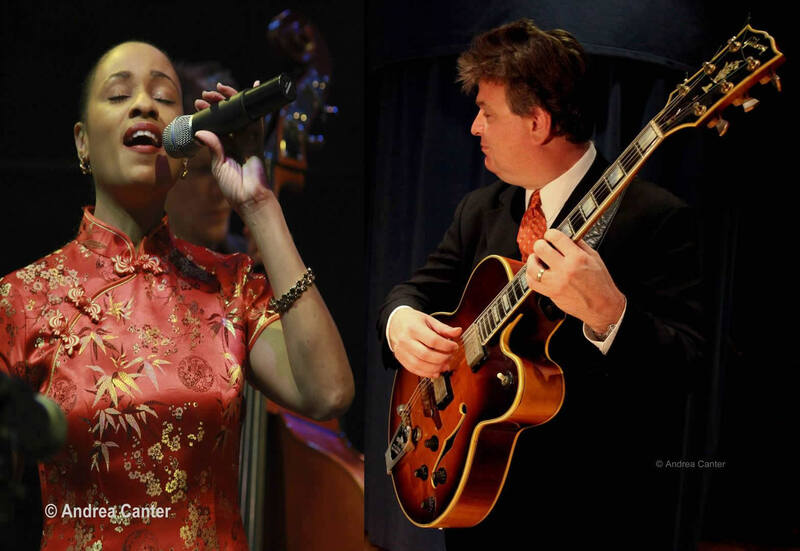 Where else can you find ten of the area’s top jazz artists on one stage? Well, OK, they don’t even fit on the stage at the AQ, spilling into the first row table area. Arrive early, since seating is more limited for the X-Tet than for most other shows!